Post, parcel and print specialist Mail Boxes Etc. is promoting the critically acclaimed art-house film Loving Vincent in its 160 UK stores this autumn. The film opens in cinemas nationwide on 13 October. The collaboration follows MBE’s successful partnership with Warner Bros. last year to promote the launch of the STORKS movie. The free prize draw includes a two-night visit to Amsterdam for two people, complete with a private viewing of Vincent van Gogh’s works. 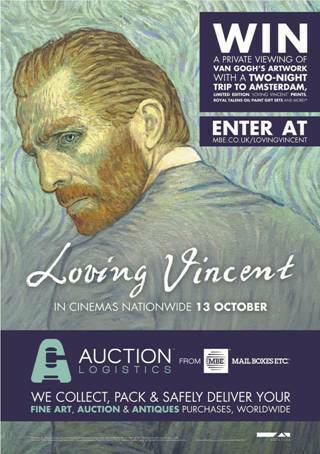 Runners-up prizes include three Loving Vincent gift sets of Royal Talens artists’ oils, from the official provider of ink to the artists who painted the 65,000 prints that make up the film. There are also 25 of the original cinema art posters, 10 pairs of cinema tickets, and 500 limited edition art prints to be won. Loving Vincent tells the unforgettable story of one of the world’s most famous artists, Vincent van Gogh, and will be released across cinemas in the UK by Altitude Film Distribution, the company who have recently released award-winning films such as Moonlight (Academy Award for Best Picture 2017) and Amy (Academy Award for Best Documentary Feature). The prize draw is free to enter at www.mbe.co.uk/lovingvincent and no purchase is necessary. Full terms and conditions are online.